On Thursday night, Shelby and I settled into our hotel. We stayed at the Clarion, which is literally a hop, skip and a jump from the Anaheim Convention Center, where the Expo has routinely been held. We knew that the Expo floor opened to General Admission at 10 a.m. and the panel that we wanted to see that day (Pixar and Walt Disney Studios: The Upcoming Films) didn’t start until 3 p.m. We thought that we would have at least an hour or so to semi-explore the Expo Floor before getting in line. We woke up bright and early on Friday and made our way over to the Convention Center around 9:25 a.m. The line to get in was already very long. We walked up to what we thought was the end. I told Shelby to wait and went up towards the front to make sure we were in the right spot. There were more people up near the front of the Convention Center, near the fountain. I asked one lady if this line was the right line to get in. She snappily responded that it was and that since she was a Silver Member for D23, she was supposed to be let in at 9:00 a.m. Wisely, I quickly thanked her and headed back down the line. I really didn’t want to hear her angry rant at the start of my weekend. 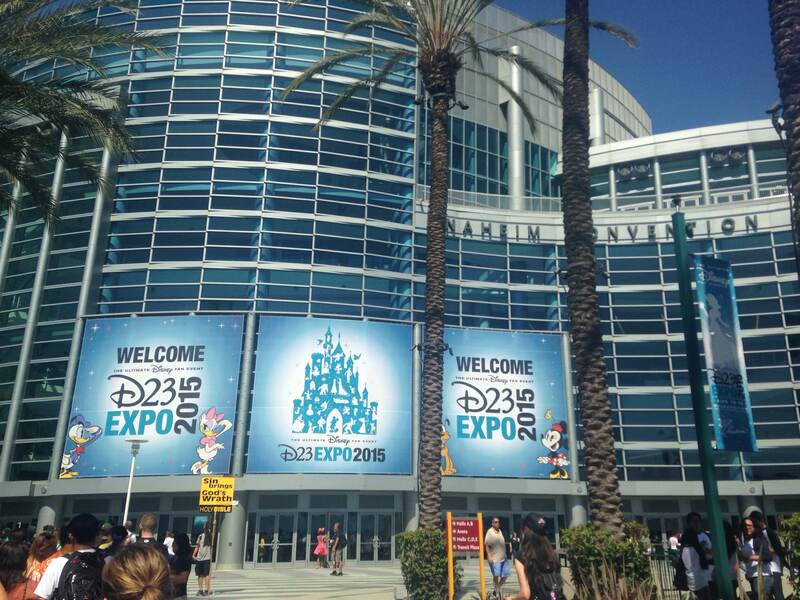 Our view of the Anaheim Convention Center as we made our way in. Around 10:55, the line started moving. It was just starting to get warmer and people were getting annoyed. Right when we got inside the main entrance area, I took a deep breath and looked around to get my bearings. I knew that we needed an event schedule and an event booklet to plan our weekend; there was a cluster of people scrabbling in front of a table and I muscled my way towards the front. 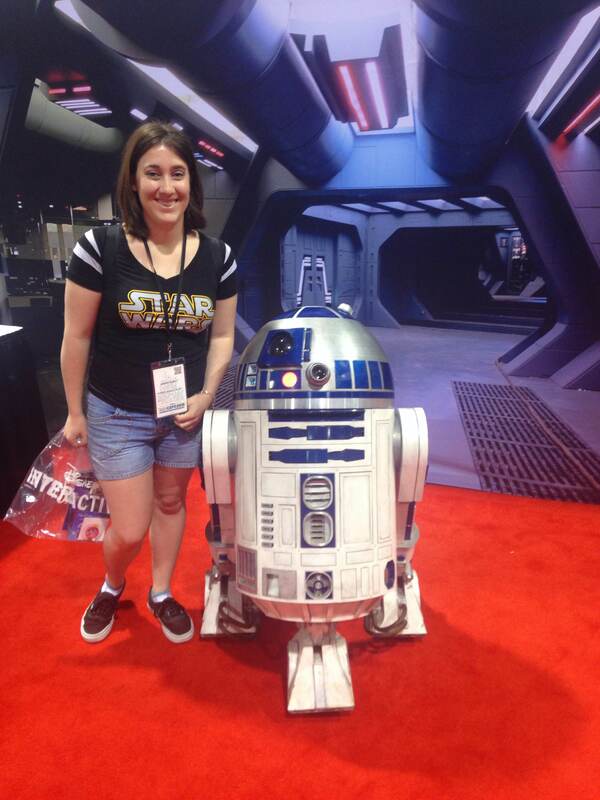 When we made it to the convention floor, we found that we were close to Hall D23, where all of the big panels were going to be held. We headed down an escalator where they were queuing other people. 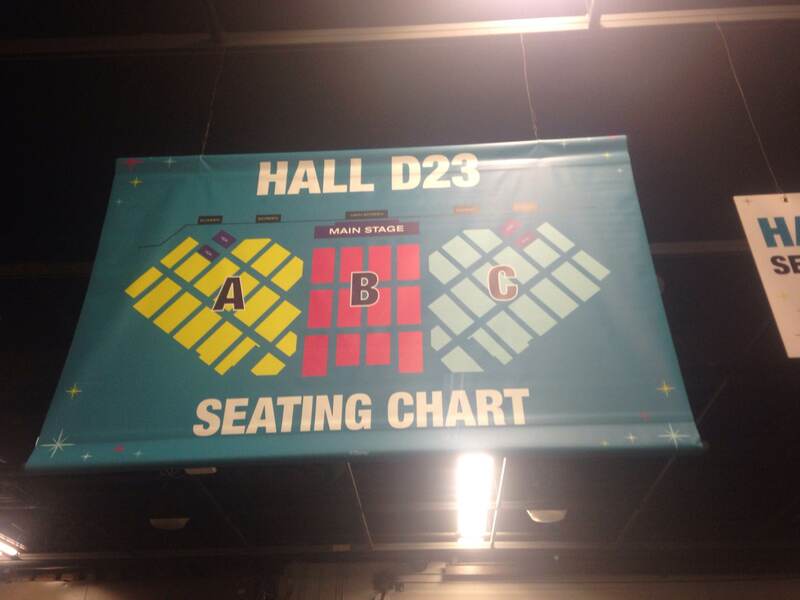 Hall D23 was split up into 3 different sections. The smallest line was in Section A so we settled in there around 11:30 a.m. I went back up and grabbed burgers, chips and Oreo’s for lunch and sodas for a caffeine boost. There were televisions that played Muppet shorts, old cartoons and Disney trivia. The wait actually didn’t seem that long and before we knew it, we were being led into the massive Hall. It sat almost 8,000 people and we got seats 3 rows back from the front. The animation panel was wonderful. John Lasseter came out in one of his signature Hawaiian shirts (and we were told that he owned over 500 different shirts) and voiced his pride about how Walt Disney Animation Studios and Pixar were both working hard on several films. The panel started off with what Walt Disney Animation Studios was developing. “Zootopia” was first, with director Rich Moore, director Byron Howard and producer Clark Spencer coming out to show clips and artwork. They shared photos from the crew’s trip to Kenya; the team wanted to study the movements and habits of the animals that they are featuring in the movie. Zootopia is the city where the story takes place and is divided into geographic climate zones like Sahara Square, Tundra Town, and the Rain-forest District. The concept artwork looked beautiful and the whole environment is very imaginative. Ginnifer Goodwin (Snow White on “Once Upon a Time”) voices Judy Hoops, a bunny who wants to be a police officer in Zootopia. She came out on stage to talk about her Disney obsession and about her character. Jason Bateman voices Nick Wilde, a fox, and the two team up to find another missing animal. The directors showed a clip from the movie in a scene where Judy and Nick to go the DMV (Department of Mammal Vehicles) which is run by sloths. The movie looks very cute and funny and I think it will be a great hit. Next, a new movie called “Gigantic” was announced. A Disney-fied re-telling of “Jack and the Beanstalk”, “Gigantic” centers around a friendship formed between our main character, Jack, and an eleven year old giant girl named Inma. Jack and Inma face off against the Storm Giants, who seemed like a nasty looking bunch. “Frozen” songwriters Kristen Anderson Lopez and Robert Lopez made an appearance to perform a song they had written for “Gigantic” called “My Little Man”. The movie seems set up to be another classic hit from Disney. My favorite presentation of the Disney Animation Studios segment was for “Moana”. It tells the story of sixteen-year-old Moana and her quest to discover and continue the traditions of her people, with the help of a demigod named Maui. Maui is voiced by Dwayne “The Rock” Johnson, who came out on stage to the delight of myself and the rest of the screaming audience. The professional wrestler turned actor talked about his character and how excited he was to be a part of the Disney family. The movie takes place in the South Pacific and it seems like the animators have taken great care into making sure this movie stays true to the culture of the people who live there. We were treated to a live performance by Opetaia Foa’i and his band, Te Vaka, who will provide the music for the movie and it was absolutely gorgeous. Afterwards, John Lasseter came back onto the stage to gush about what Pixar has been working on. First, the audience was treated to “Riley’s First Date?”, a short that will accompany “Inside Out” when it makes its’ DVD debut later this year. The short was ridiculously funny and should be a favorite for fans of the movie. Next was a presentation for the “The Good Dinosaur”, which is set for release this November. I know that originally “The Good Dinosaur” was supposed to be released before “Inside Out”, but story development and a director change delayed its Summer 2014 debut. The story still centers around a young dinosaur named Arlo and the human named Spot. The filmmakers described the movie as the classic story of a boy and his dog and their journey home, except in Pixar’s case, the “boy” is a dinosaur and his “dog” is actually a human. The animation looks stunning and, knowing Pixar, this movie will probably be another home-run. Ellen DeGeneres came onstage to help present a sequel that she has been demanding for years: “Finding Dory”. In the sequel, Dory, Marlin and Nemo travel to Monterrey Bay, California to find Dory’s family. It was revealed that Dory’s parents are going to be voiced by Diane Keaton and Eugene Levy. A crew of new characters, including an octopus named Hank voiced by Ed O’Neill and a beluga whale named Bailey voiced by Ty Burrell (both of “Modern Family” fame), will be helping Dory in her journey. The clips were funny and the movie looks like a solid sequel. The last two presentations for the Pixar segments were more announcements than real presentations. Their “Day of the Dead” themed movie that was announced at 2013’s Expo is officially named “Coco”, and the story centers around twelve-year-old Miguel. John Lasseter came back out to talk about “Toy Story 4” and announced that he would be directing it. He talked about how the filmmakers at Pixar made a promise to each other after “Toy Story 3” to never make another “Toy Story” movie unless a really really really good and worthy story needed to be told. This next movie will focus on Woody and Buzz trying to find Woody’s lost love, Bo Peep, who was noticeably absent in the third movie. Lasseter said this story was inspired by his wife and their love for each other. Personally, I was totally happy with how the “Toy Story” trilogy ended but I would be lying if I said I wasn’t going to be lining up to see this new adventure. Lasseter also reminded the crowd that the original “Toy Story” was 20 years old. In honor of its anniversary, the super adorable Randy Newman came onstage to play the piano and sing “You Got a Friend in Me” while a host of “Toy Story” characters made appearances onstage and confetti rained from the ceiling. 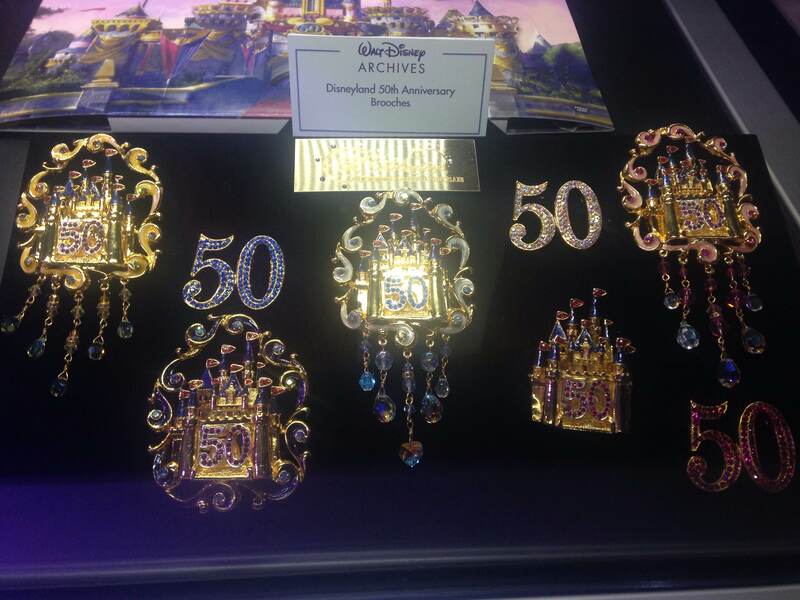 When Shelby and I finally made our way out of Hall D23, we found that three hours had passed. We decided that an hour wasn’t enough time to fully experience the main convention floor so we headed back to our hotel for some food, meet up with Nate and Jen, and get ready for the next day. 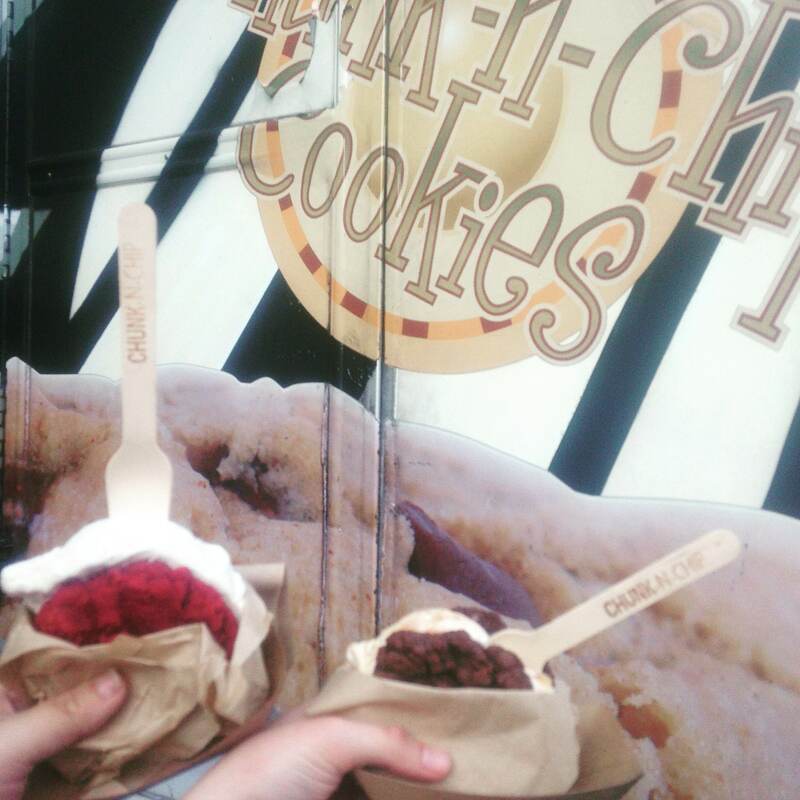 Not before stopping at a food truck for a sugar boost. By next day, I actually mean the late evening. 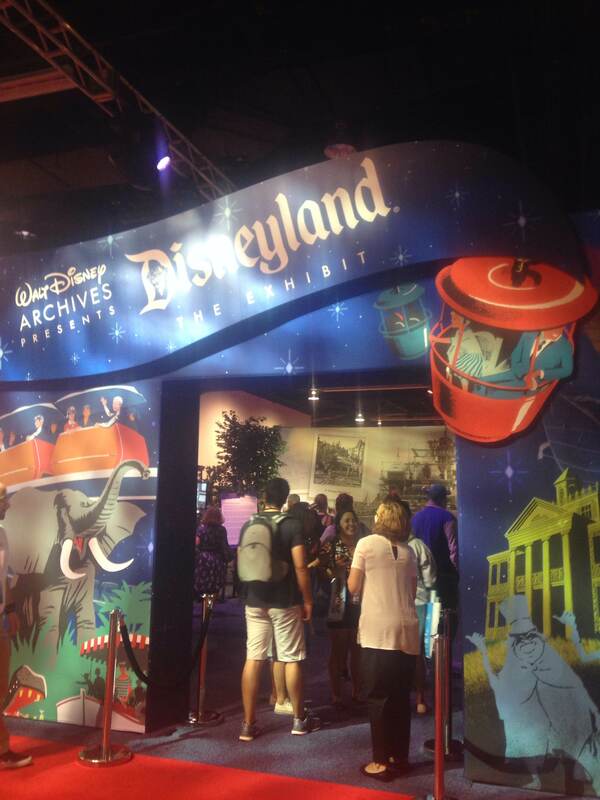 This year’s D23 Expo was the first time Guests were allowed to line up the evening before to get a guaranteed spot in the next morning’s panel. Friday’s first panel wasn’t something that I was dying to see, but we all knew that Saturday’s first panel (Worlds, Galaxies, and Universes: Live Action at The Walt Disney Studios) was something that everyone would want to see. Armed with pillows, blankets and clothes, we became those crazy people who camp overnight for stuff. I never ever thought I would be one of those people. But there I was lining up at 9:35 p.m. on a Friday night for a panel that didn’t start until 10:30 a.m. the next day. Even at 9:35 p.m., the line stretched from the doors of Hall E around the side of the building towards the back. We started moving around 10 pm. (which was actually the original time people were supposed to start lining up) and quickly made our way inside. We lined up in the same section as before, guaranteeing ourselves a very good spot for this panel. I thought I was prepared. I really did. I had a sweatshirt and a couple of blankets. I can usually fall asleep almost anywhere. But I had forgotten that Hall E was an underground section of the Convention Center. With concrete floors. And blasting air conditioning. I was freezing. There was no way I could sleep in this environment. Luckily, I was camping out with two angels. 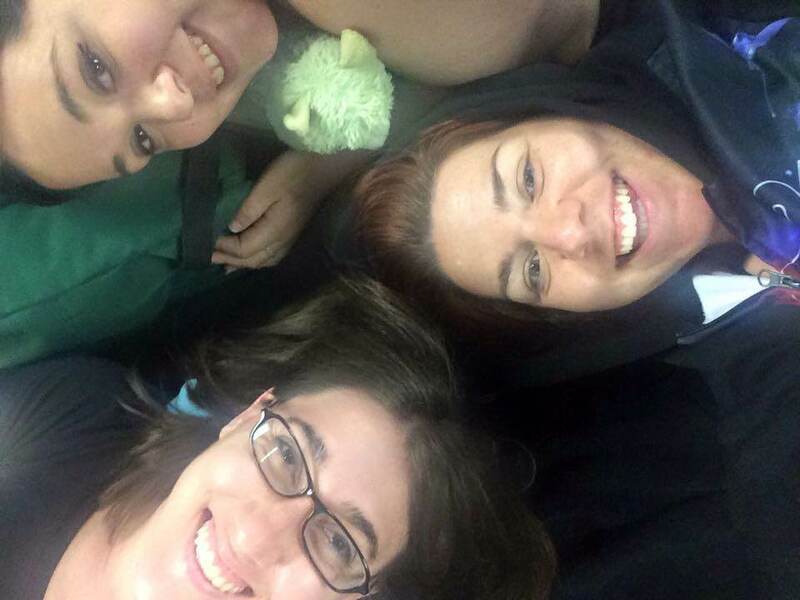 Shelby realized that she couldn’t sleep without her pillow and Jen said she had more blankets in her car, so the two of them set out to get a few more things that would make our group more comfortable. Jen returned with more than a couple of blankets. 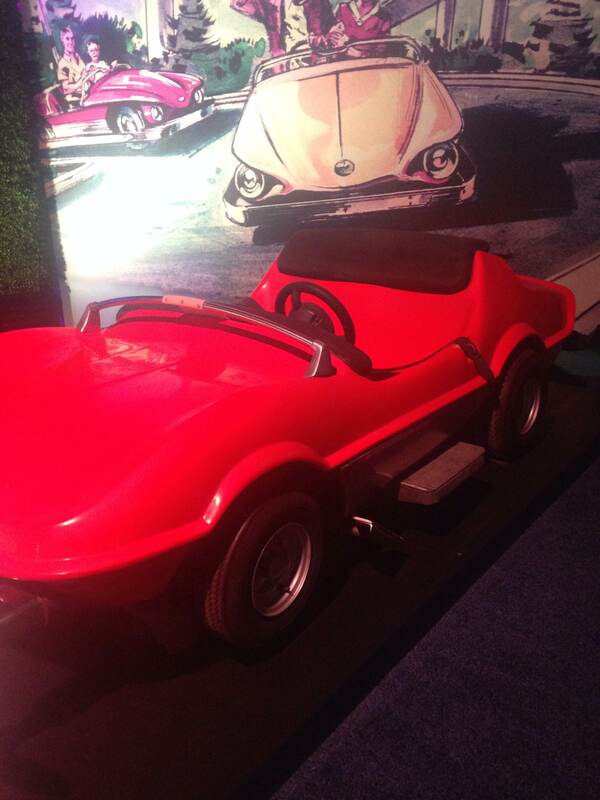 She found a bright pink one-sie in her car that had Tinker Bell printed all over. 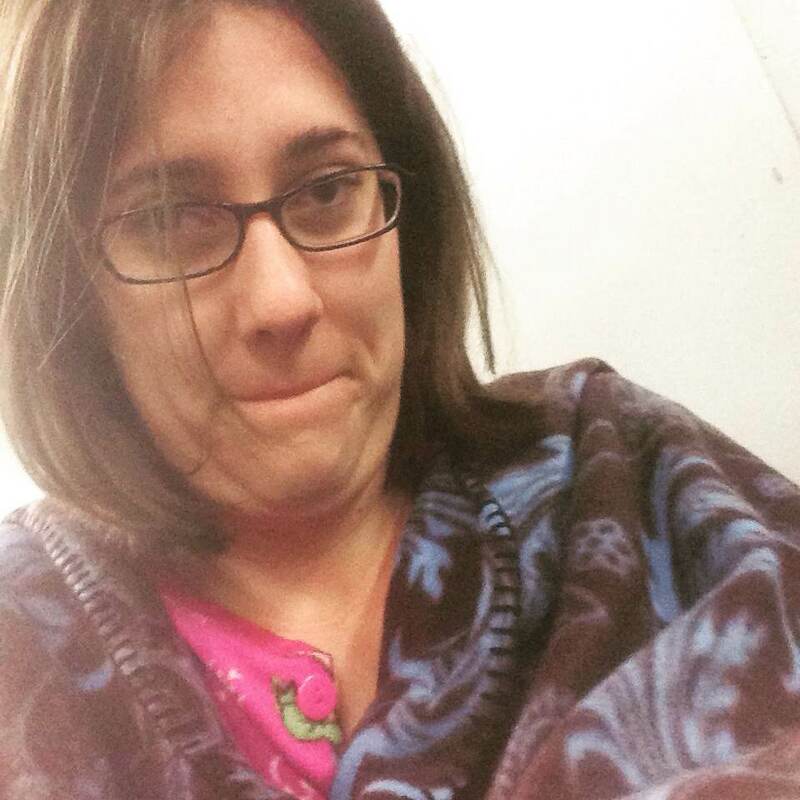 I snatched it up and was toasty warm for the rest of the night. Woke up blurry-eyed but ready for an exciting panel. I can’t remember the exact time I put on that one-sie or even how many hours of sleep I actually got but I do remember waking up to lots and lots of people. When had they shown up? Did they all spend the night too and I had just missed it? Time Lapse Photo: The first one was before I fell asleep and the second was when I awoke. Still, it was somehow nice to know that I was in good company. I surrounded by my close friends and we were making experiences and memories that we would talk about for the rest of our lives. The line moderators were very good about keeping everyone posted as we got closer to the time for the actual panel. 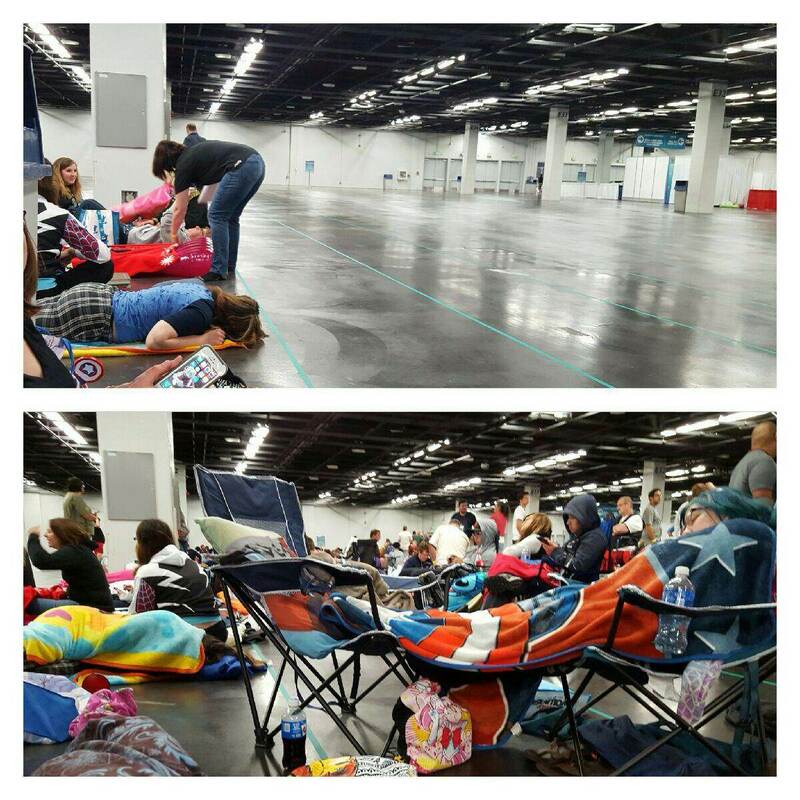 When they gave a 1 hour announcement, Jen and Nate packed up most of our blankets and pillows and made a quick walk back to Jen’s car to put things away. We changed and got presentable for the day and before we knew it, we were making our way back inside Hall D23 for the panel. Again, we got awesome seats a few rows back from the front. We could see the stage and the large video screens, so no matter where we looked we would experience a good show. Marvel Studios was first to present. Kevin Feige, president of the studio, wasted no time in explaining Marvel’s next stage of movie releases. “Dr. Strange” is currently in pre-production and I half-expected half-desired Benedict Cumberbatch (who plays said Doctor) to come out onstage. Alas, we were only treated to a video message from Cumberbatch, who reassured the audience that this movie will be worth the wait. We also got to see some really gorgeous concept art. “Captain America: Civil War” was next. Chris Evans and Anthony Mackie appeared for a brief visit and talked about their love for Disney and Marvel and how excited they were for everyone to see this movie. The scenes that we got to see promise another action-packed Marvel adventure. I was expecting a bit more from Marvel but they didn’t really have a lot to present. Walt Disney Studios president Sean Bailey came on stage next to show what the live-action segment of Disney was working on, and it’s a lot. Movie 1: “The Finest Hours” starring Chris Pine (of “Star Trek” and “Into the Woods” recent fame). Pine came onstage to talk about the movie, which is based on the true story of a Coast Guard rescue mission in 1952. We were shown a clip and the movie looks like an intense heart-stopper. Movie 2: “The Jungle Book”. Director Jon Favreau came out to talk about how he was very insistent that this live-action version would be a mix of the Disney classic and the original story from Rudyard Kipling. Stars Ben Kingsley (who voices Bagherra), Lupita Nyong’o (who voices mother wolf Raksha), and newcomer 12-year-old Neel Sethi (who plays Mowgli) talked about their experience filming the movie and working together. Sethi was adorable and looked slightly overwhelmed by the size of the audience. We were shown a sizzle reel and it looks gorgeous. The special effects blend in very well and are very life-like. The cast round-up that Disney was able to get for this movie has me very excited. Movie 3: “Alice: Through the Looking Glass”. A follow-up to Tim Burton’s 2010 ‘Alice in Wonderland” find Alice back in Wonderland and traveling through time to save the Mad Hatter. While Burton is back on board only as a producer, the films looks and will probably feel the same. I’m not sure a sequel was entirely needed but Disney has brought back much of the original cast (including Mia Wasikowska as Alice, Helena Bonham Carter as the Red Queen, Anne Hathaway as the White Queen and Johnny Depp as the Mad Hatter) so that was a welcoming sight. Movie 4: “Pete’s Dragon”. Another remake of a Disney classic, this time starring Bryce Dallas Howard (of recent “Jurassic World” fame) and Robert Redford. His name alone makes me want to see this movie, and the clip that we were shown looks very good. We didn’t get to see much of what Elliot the Dragon is going to look like this time around, but the slight glimpse offered something like a mixture of fur and hair. Movie 5: “The Queen of Katwe”, another movie starring Lupita Nyong’o about a young girl from Uganda who become a world-class chess champion. The movie also stars David Oyelowo (“Selma”) but other than that not a lot of detail was presented. Movie 6: “Beauty and the Beast”. Honestly, I get super excited where anything about this live-action remake is discussed. “Beauty and the Beast” is one of my favorite Disney classics and from the moment they announced the ridiculously wonderful cast for the remake, I have been restless and I just want this movie to be here now. We were treated to a movie message from London (where the movie is currently being filmed) by Emma Watson (who is playing Belle) and Luke Evans and Josh Gad (who play Gaston and Le Fou respectively) sang a few bars of the “Gaston” song. The snippets of behind-the-scenes shots that we got to see just made me more excited for this movie. Movie 7: “Pirates of the Caribbean: Dead Man Tell No Tales”. I was less than enthusiastic when Disney announced that they were doing another Pirates movie. I thought that the first one was perfection but they just kept making more and more. The fourth movie didn’t have Elizabeth (Keira Knightley) or Will Turner (Orlando Bloom) in it and, honestly, I didn’t even make an effort to see it when it was in theaters. However, my absolute favorite thing about these movies (and I think, everyone’s favorite thing about these movies) is Johnny Depp as Captain Jack Sparrow. So when Depp sauntered onstage in full costume and character, I screamed extremely loudly along with the rest of the room. It was the best thing I’ve ever seen. He snacked on some grapes and threw them to the audience and casually made a joke about his induction into Disney Legend fame. Disney also announced that Will Turner was coming back for this new movie and that Javier Bardem is joining the cast as Captain Salazar. So, I might go see this next Pirate movie. 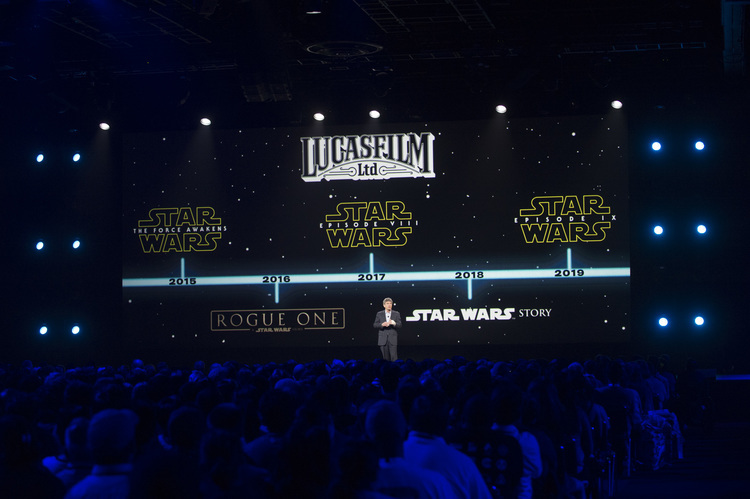 Last but definitely not least, Lucasfilm took the stage to talk about what everyone who had spent the night on that cold concrete floor had been waiting for: Star Wars. A quick photo layout promised a new Start Wars film every year until 2019. We got a video message from “Rogue One: A Star Wars Story” director Gareth Edwards and the first official cast photo from the set. “Rogue One” takes place between Episodes III and IV and tells the story of how the Rebels stole the Death Star plans from the Empire. I’m mostly excited about this movie because it stars Felicity Jones as the main character and she is a wonderful actress. Next, JJ Abrams took the stage to talk about “The Force Awakens”. We were treated to more pictures of the set and the cast (Oscar Issac, John Boyega, Daisy Ridley) joined him onstage. Harrison Ford made a surprise appearance and the crowd was cheering so loudly and standing for so long that the poor man could barely get two words in. But he looked excited and humbled to be continuing his iconic role as Han Solo. We were told that we would be receiving prints of the new movie poster on our way out. Lastly, Disney CEO Bob Iger came onstage and announced the addition of a Star Wars land to Disneyland and Walt Disney World. If you were in the room, you would have thought that everyone in attendance had just been given free Annual Passes to Disneyland for life. The whole place erupted in cheers. As more and more details continue to be revealed, I am excited to see how this land is going to take form. 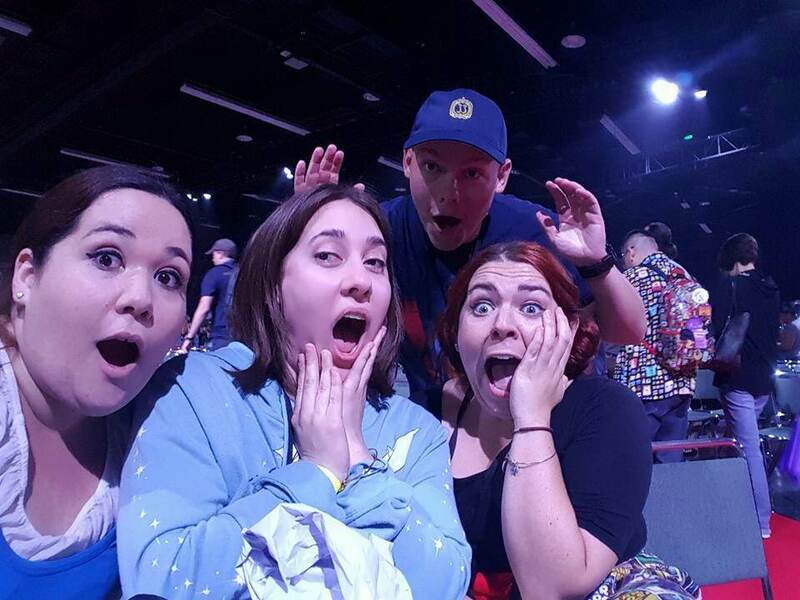 Shelby, Jen, Nate and I were still reeling from all of the excitement when we finally exited Hall D23. 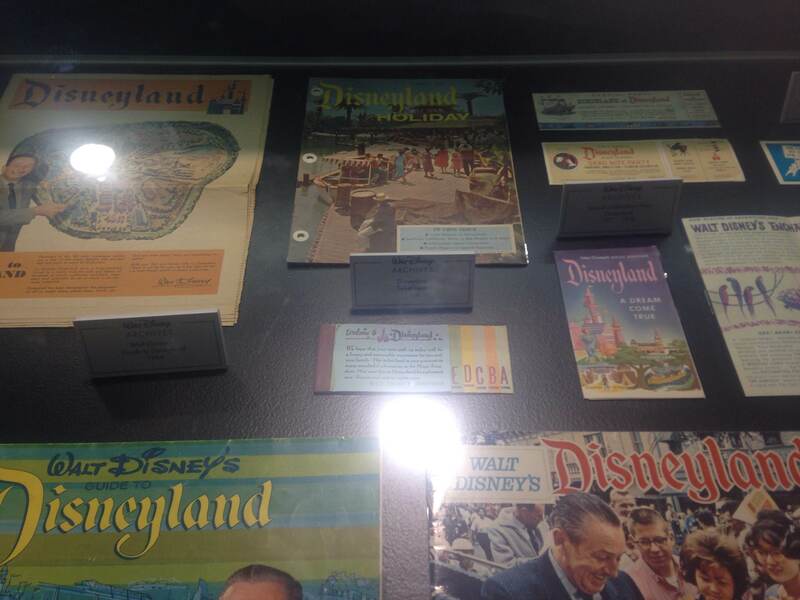 We made a quick journey back to our hotel room to drop off our posters then made our way back to the Expo to check out what the Walt Disney Archives had brought for us to see. The exhibit for this Expo was titled “Disneyland: The Exhibit” and showcased all the wonders of the Disneyland Resort, which is celebrating its’ 60th anniversary this year. Now, if you have read a few of my other posts, you should know by now that I love Disney. 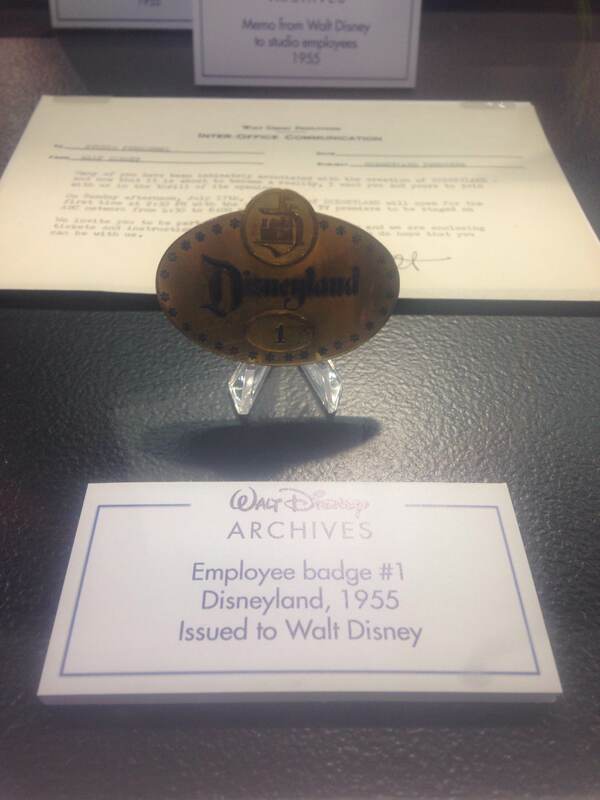 One of the most fascinating things to me is the history of Disneyland: how it was built, how it has changed, and how it will continue to change and grow and still be one of my favorite places in the world. So, I was absolutely enamored with this exhibit. No apologies for the following photo spam. 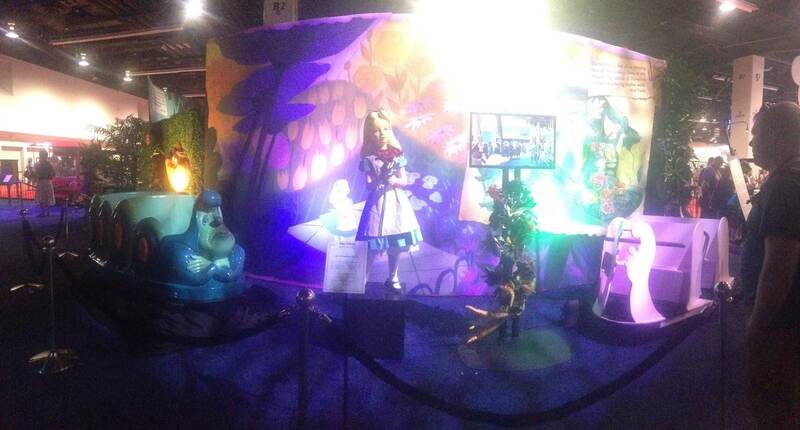 The original Alice prop from the Alice in Wonderland attraction that was recently updated. 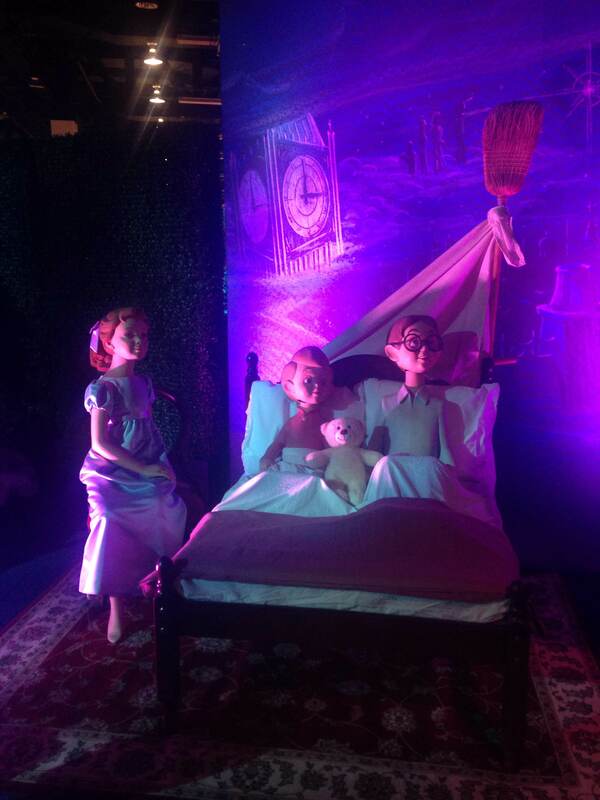 Animatronics from the Peter Pan attraction. 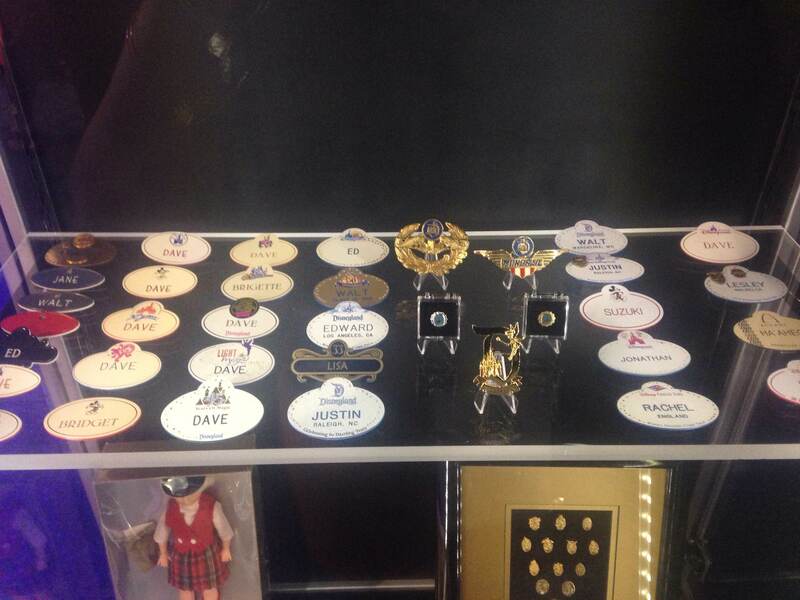 These were recently replaced by a few updates to the attraction. 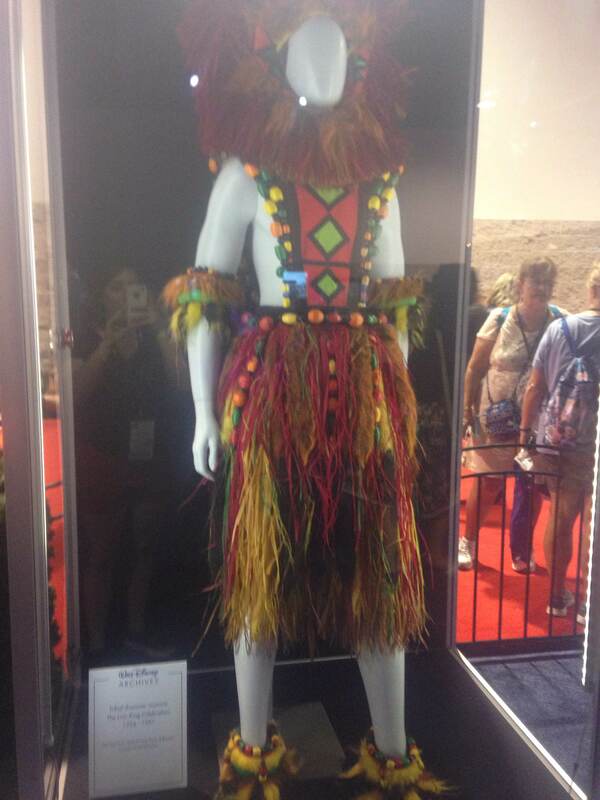 A costume for the Tribal Drummer from The Lion King Celebration parade that ran from 1994-1997. 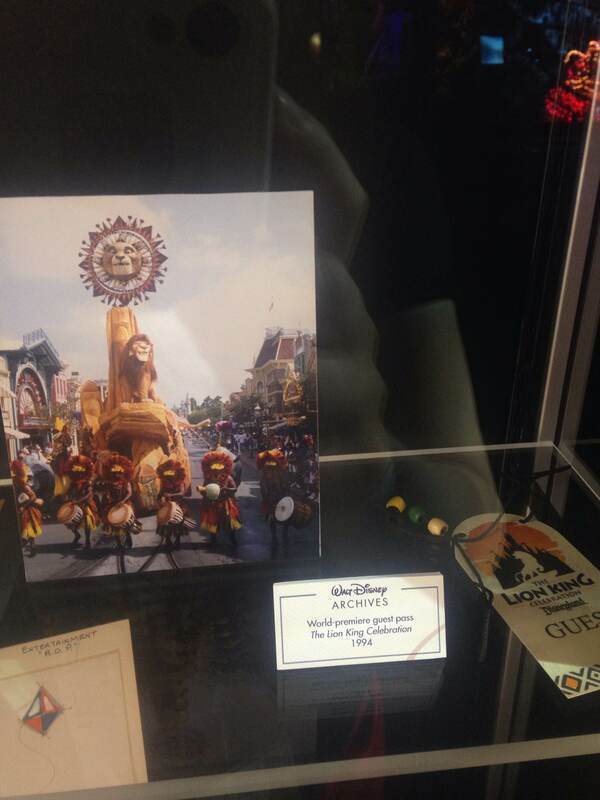 Invitations from the opening of the Lion King Celebration parade in 1994. 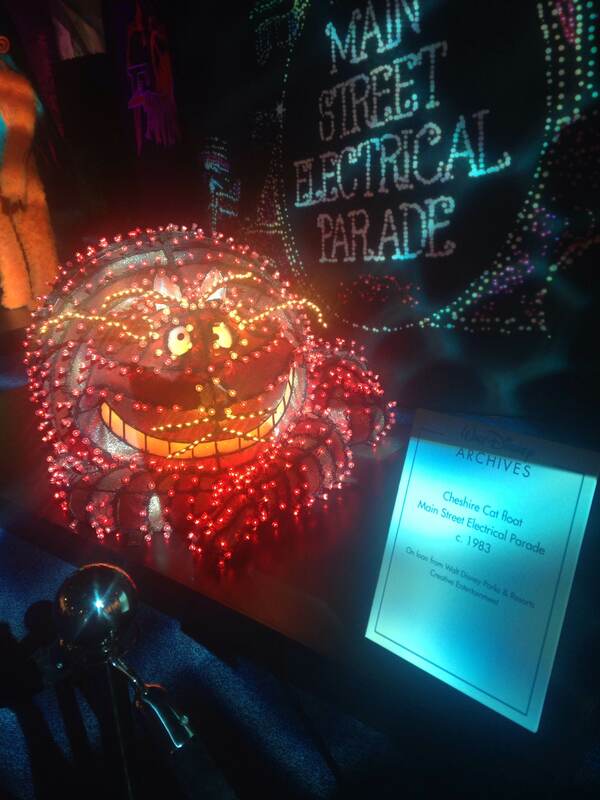 Not ashamed to admit that I have a copy of this parade on VHS. 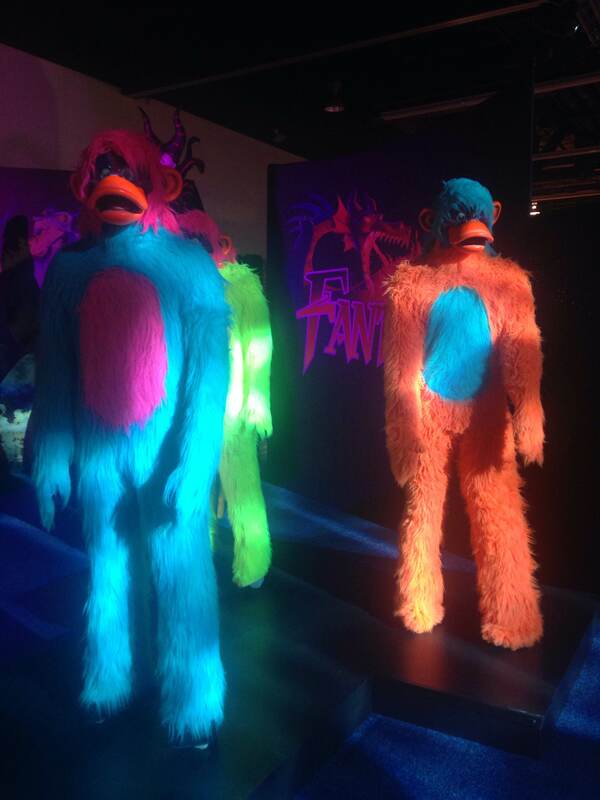 Monkey costumes (from 1992) from Fantasmic! 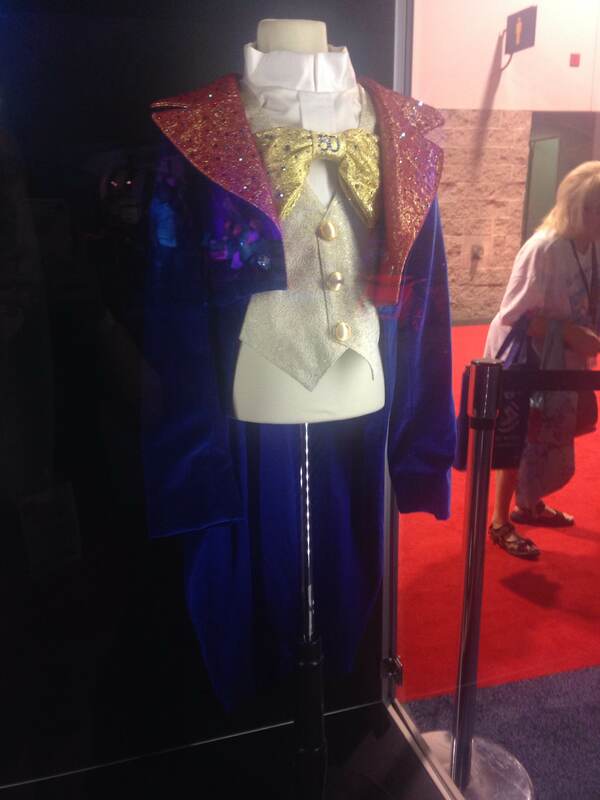 1992 Malificent costume from Fantasmic! 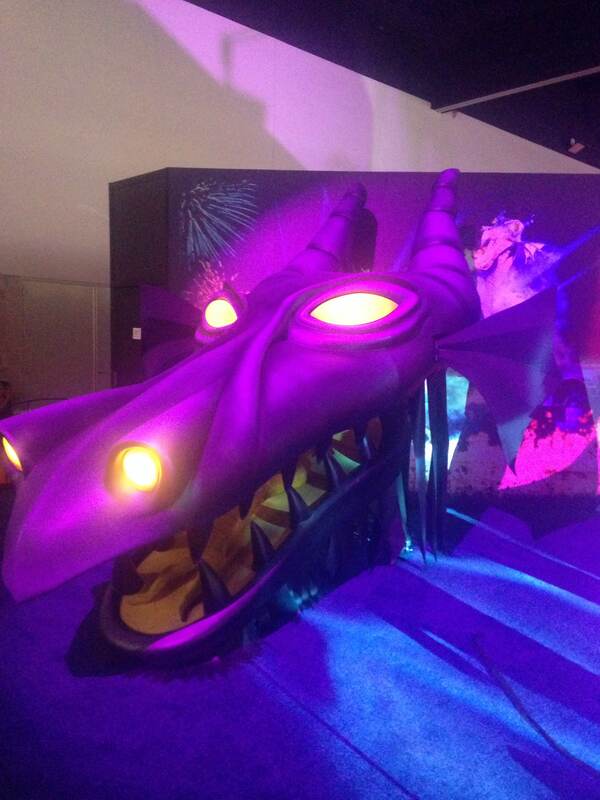 1992 Malificent dragon head from Fantasmic! 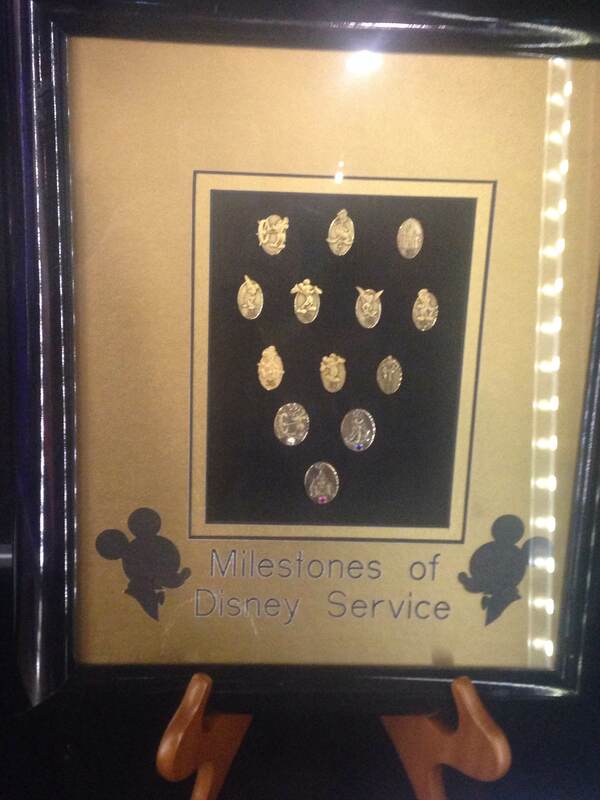 These are the different pins that Cast Members receive depending on how long they have been with the Company. So far I only have 1 but I hope to earn several more. After we got our fill of Disneyland history, we made our way over to the theme park pavilions to see what the future has in store for the new Shanghai Disneyland park and the Avatar-themed land taking shape in Disney’s Animal Kingdom in Florida. There wasn’t a lot to see for the Avatar-themed land but the scale model that showed what the area would look like as it transitioned from daytime to nighttime was immensely detailed. The new land looks very immersive and I hope that it brings the gorgeous forests from the movie to life in a way that only Disney can do. 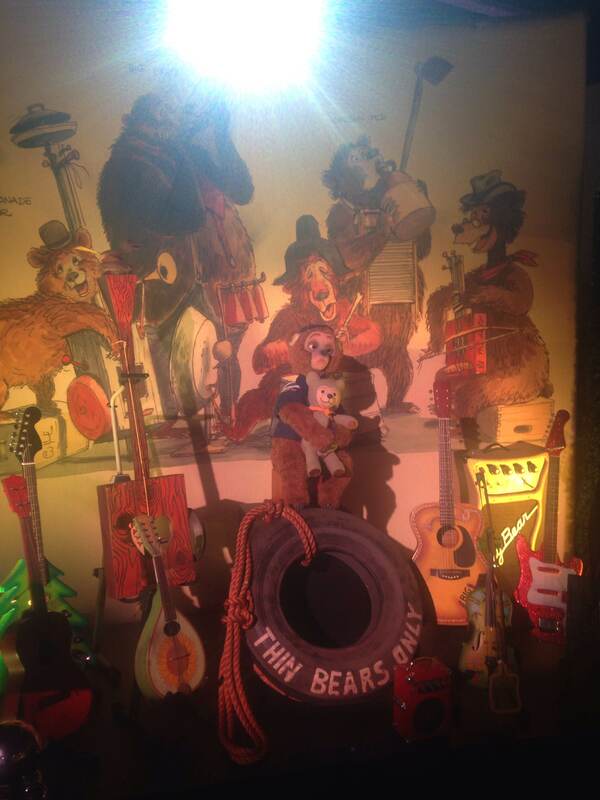 The exhibit for Shanghai Disneyland was much more detailed and I hope that I can visit this park some day soon. Mickey Avenue looks like their version of Disneyland’s Main Street. 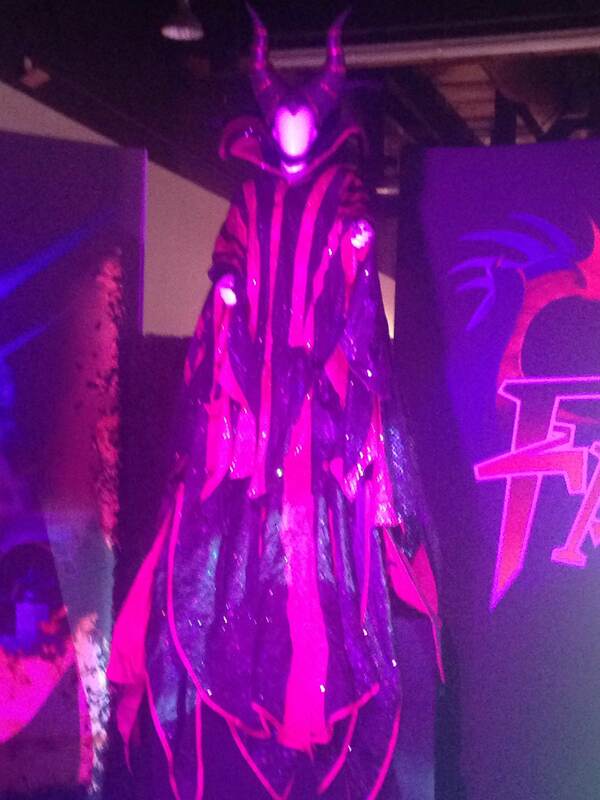 They had scale models of the building and mannequins modeling Cast Member costumes. Their Fantasyland boasts the gigantic Enchanted Storybook Castle. This is going to be the first Disney Parks castle that represents all of the Disney Princesses. It’s going to be gigantic and have meet-and-greets and other attractions inside. Other Fantasyland attractions are going to include Peter Pan’s Flight, the Seven Dwarfs Mine Train, The Adventures of Winnie the Pooh, an Alice in Wonderland themed walk-though maze and a new attraction called Voyage to the Crystal Grotto which ends inside Storybook Castle. Gardens of Imagination looks to be the Hub of Shanghai’s park. It’s situated at the center of the park and I think it is going to the first Hub of a Disney Park with interactive features and a few attractions. Adventure Island looks very cool. Similar in theme to Disneyland’s Adventureland, the big E-ticket attraction looks like it is going to be Roaring Rapids, a water ride that promises some very realistic looking Animatronics. 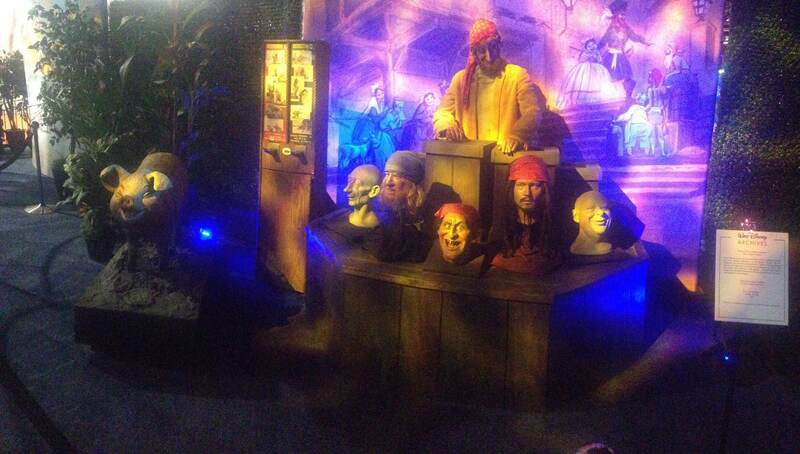 Treasure Cove is an entire land dedicated to Pirates of the Caribbean. It’s going to have themed restaurants and stores, a play area for kids and a Pirates attractions with a new immersive adventure for Guests. Their version of Tomorrowland makes me insanely jealous. Mostly because Shanghai is getting a freaking Tron-themed roller-coaster called the Lightcycle Power Run! A Buzz Lightyear themed attraction and a newer version of Rocket Rods was also shown but I just can’t get over how insanely cool the artwork, concept and costumes for the Tron attraction was. The two hotels for Shanghai Disney look very cute: the Shanghai Disneyland Hotel and the Toy Story Hotel. DisneyTown is their version of Disneyland’s Downtown Disney. To wrap up the evening, we did some shopping at the booths and grabbed some dinner at IHOP. Jen and Nate headed home and Shelby and I returned to our hotel room and promptly crashed for the night. 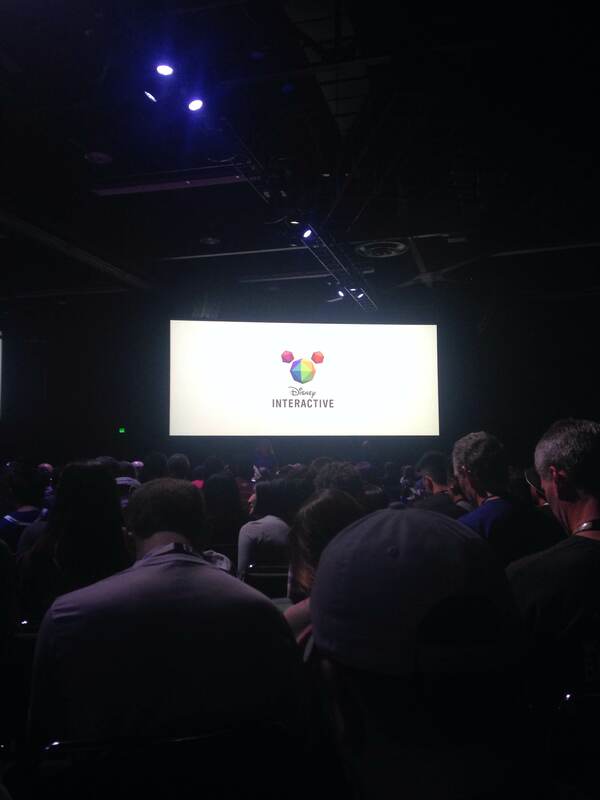 On a whim, I decided to attend the panel that Disney Interactive was showing. 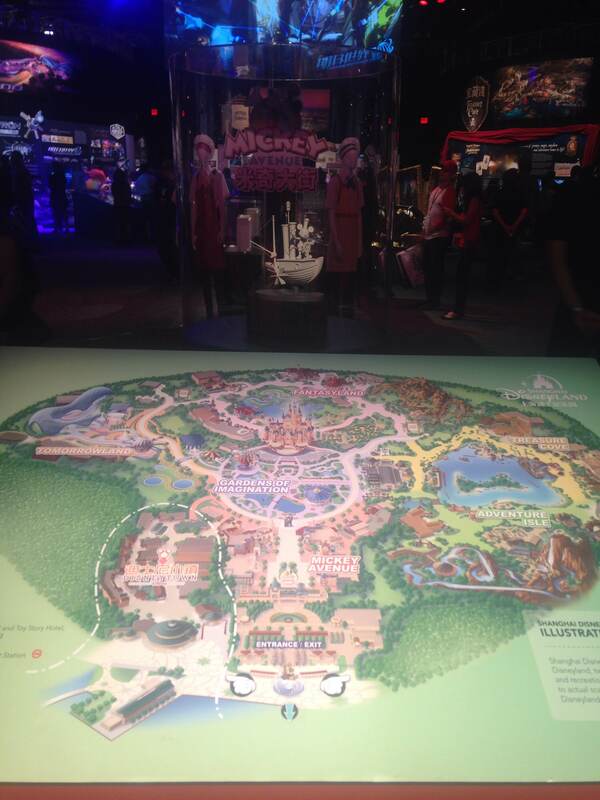 They talked about new mobile games, including one called “Disney Magic Kingdoms”, that looks like a cross between Roller Coaster Tycoon and Sims, in that you can build your own park and control Disney characters and possibly battle some Disney villains. Interestingly, this was a big panel where they didn’t make you stow away your electronics. Several new sets were announced for the extremely popular Disney Infinity, including several “Star Wars”-themed sets (both old movies and new). Daisy Ridley and John Boyega appeared onstage to show off figures that were modeled after their Star Wars characters then signed them and gave them away to two very lucky kids in the audience. 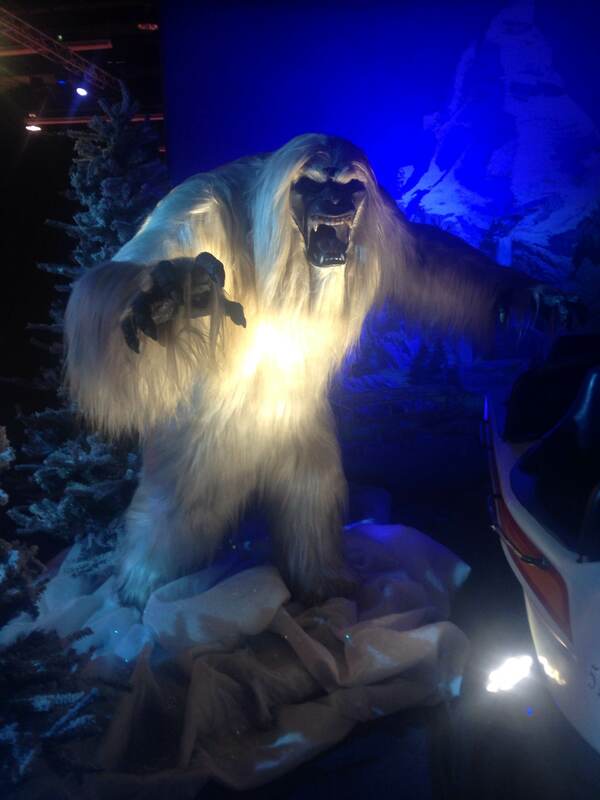 Sets for “Zootopia” and “The Good Dinosaur” were also announced. The new “Star Wars: Battlefront” games will include a free level on Jakku, which is the one of the new settings for “The Force Awakens”. A gorgeous Darth Vader-themed PlayStation 4 was also unveiled. The only real thing I was wanted to hear about from this panel was anything from the “Kingdom Hearts 3” game. A “Big Hero 6” level in this game will take place after the recent movie and Baymax (the robot from the movie) came onstage to help with that announcement. 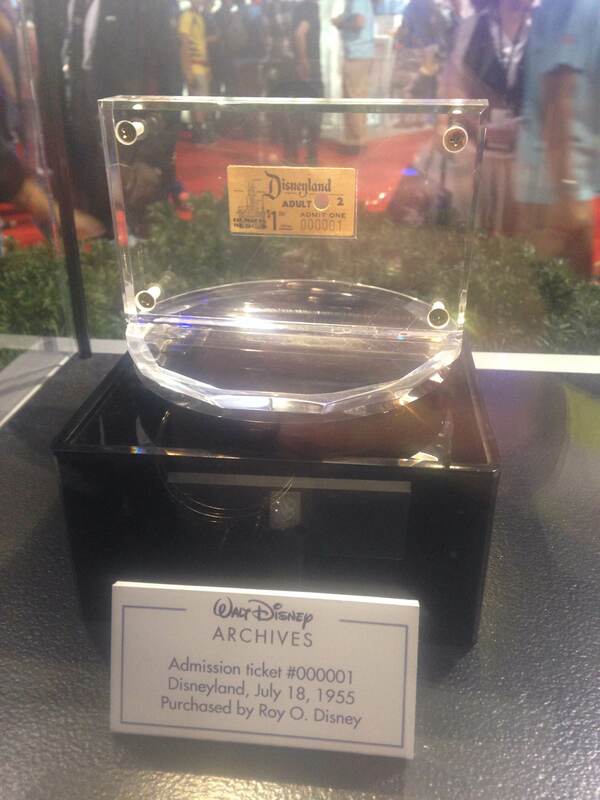 I walked away from that panel with a Mickey figure for Disney Infinity and a renewed interest in video games. 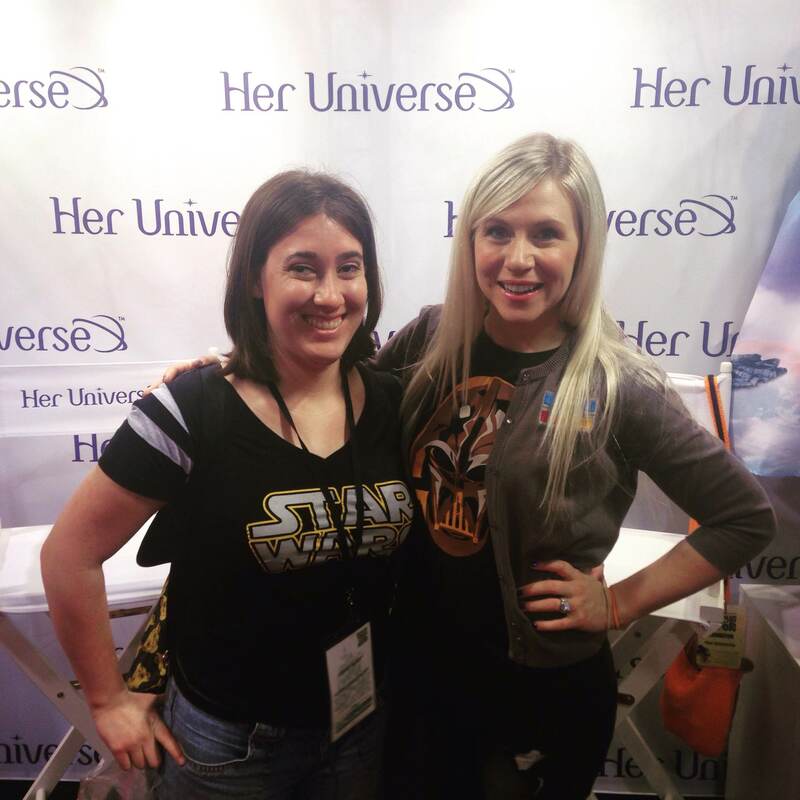 I wandered around the Expo for a little bit, stopping at the Expo store to shop and see if I would run into any friends, before I headed over to the Her Universe booth for a photo-op with Ashley Eckstein, who founded the company. She was an absolute sweetheart and we talked about how, thanks in part to her company, girls are becoming more comfortable showing their geek side and there are finally more clothes for us to be able to express that. 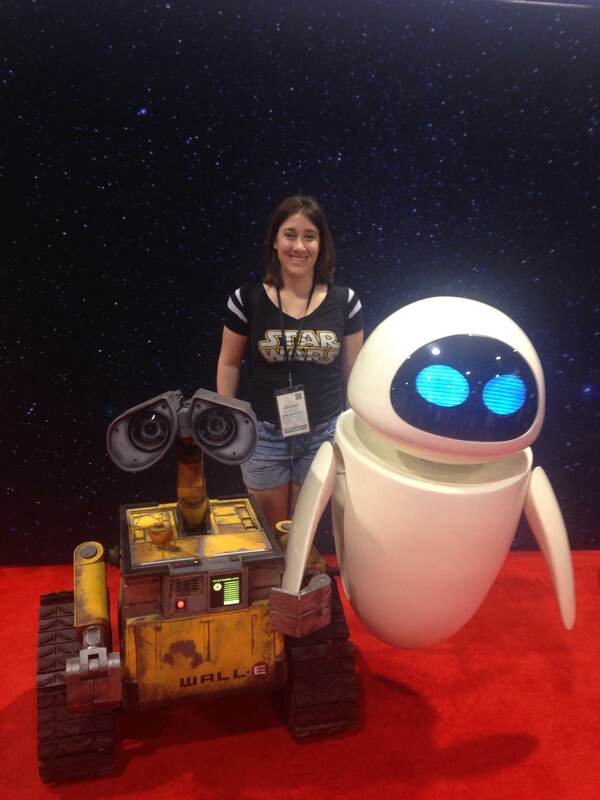 I snapped some pictures with R2-D2 and WALL-E and EVE at a booth hosted by the WALL-E Builders Club. At one of the many stages on the Expo floor, Disney was getting ready to preview one of their new shows that is coming out soon called “The Lion Guard”. Essentially, it expands on the story of “The Lion King”, my favorite Disney movie of all time, so I had to go check it out. 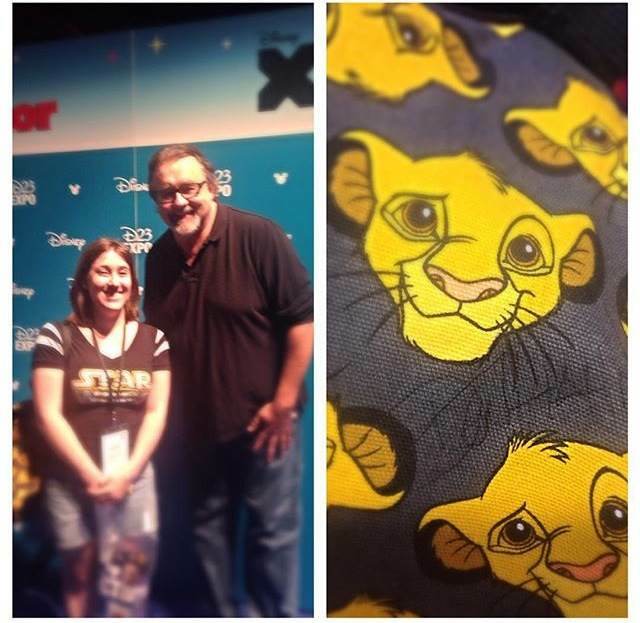 Don Hahn, the producer of “The Lion King”, was on hand to introduce the little clip that the animators had brought. I tried to keep in mind that this new show is going to be on Disney Junior so it is aimed at a slightly younger audience. It looks cute and I might try watching it when it premieres. After the presentation was over, I went towards the left side of the stage to head around to Mickey’s of Glendale, which was a store full of merchandise from the Imagineer headquarters in Glendale. I noticed Don Hahn sort of lingering by the stage, probably gauging the audience’s reaction, and taking pictures for some press. I lingered. I noticed some other people with pens out and wondering if he was staying for fan photos and autographs. He wasn’t. Not officially anyways but a small line started to form, maybe four people long, and without any hesitation, I jumped in and grabbed a spot. Two more people lined up behind me and a Cast Member cut off the line before it got too long. And there I was scrambling for a pen for him to sign my Lion King backpack and before I knew it, he was smiling and saying Hello. I asked him to sign my bag and then proceeded to just talk and talk and talk and talk about my favorite movie. He was so nice and seemed very happy that a movie that he had made still received so much love from so many people. No lie I fangirled so hard. You can barely see his autograph but I know it is there and that’s all that matters. Still grinning with excitement, I spent the rest of my day shopping and buying souvenirs for myself. I stayed on that Expo floor until the very last minute, when they shut off the lights and basically kicked everyone out so the massive clean-up could begin. I met Shelby and we swapped stories about our days and headed home. It was a ridiculous weekend but it was so much fun. 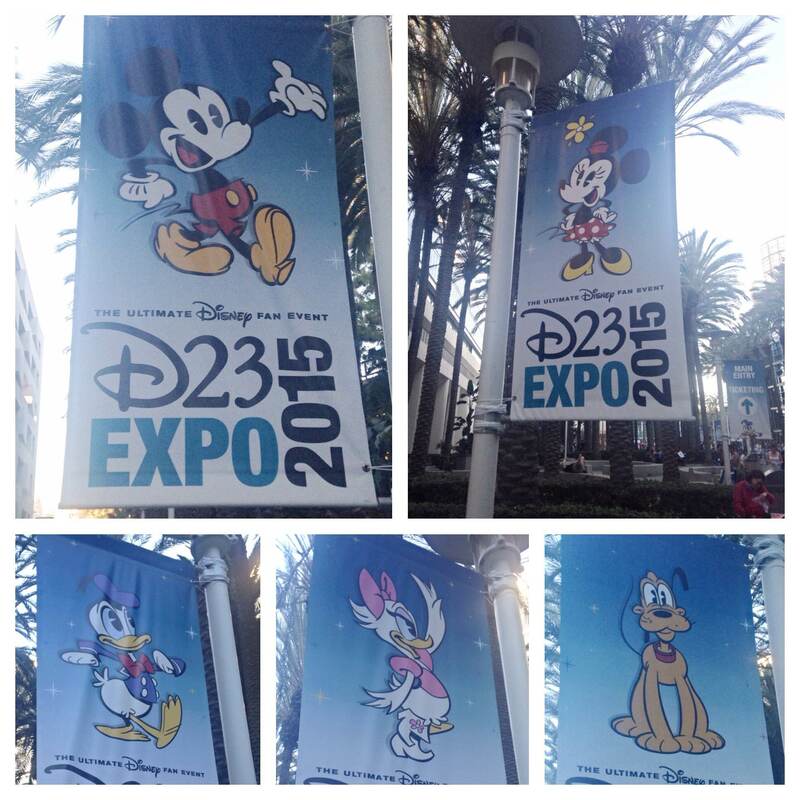 I can’t wait for the next Expo to come around and see what Disney has in store for the future.